Does this new mobile game "strike" out? Photo credit FoxNext and Marvel. A new videogame! Marvel superheroes! RPG elements! Awesome, awesome, awesome!!! FoxNet Games has taken my favorite things and crammed them into a portable title that I can use to battle Marvel villains on the go. Does the final conglomeration mash together to form an Avengers-like combination of cool? Or does it crash and burn like every Fantastic Four movie ever made? Seriously, they couldn’t get one right. 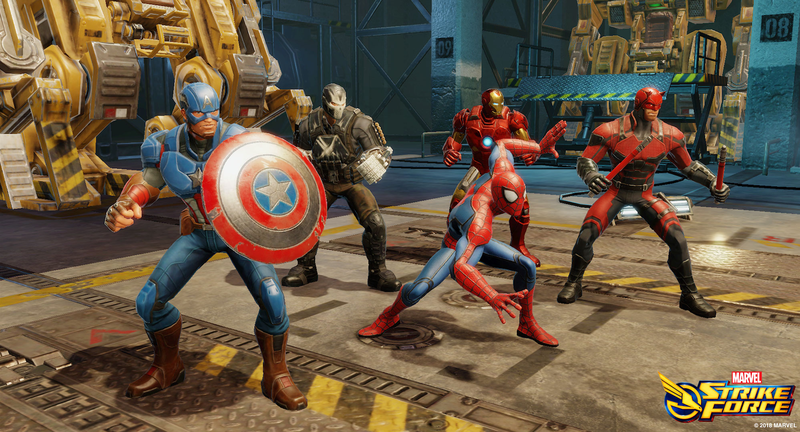 Not even the reboot of the reboot…but sorry, back to the Marvel Strike Force review. The story leaves a lot to be desired here. Ultimus is taking heroes and villains from multiple universes and locking them in alien orbs. 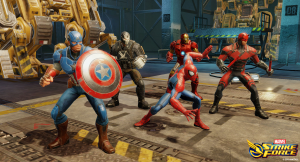 It’s your job as the hero Commander to free the characters, direct their attacks, and then give them better equipment to beat up the baddies and work your way to beating up Ultimus. The main menu is slightly confusing with too many things to click on, but once you enter the battle things can get interesting quickly. But wow, does this game look good. My android phone is a bit older, but the graphics pop off the screen. The interface is easy to use, and the RPG elements fit the mobile environment perfectly. Battles are quick, with a “rock, paper, scissors” element to strengths and weaknesses. The special attacks look awesome for the main heroes. I appreciate the care that went into the battles. The premise of the story itself is to get the player to unlock orbs. One can do this in two ways, by slogging through numerous enemies with low level characters and slowly gaining game credits. Or, you can buy orbs with real money. Full disclosure, I am not against the concept of free-to-play games. In fact, I’ve had quite a bit of fun with several of them over the years. 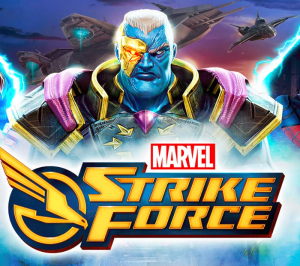 The problem with Marvel Strike Force is the way that FTP is rolled out here. When you get an orb, whether bought or gained by playing, the results of the orb opening are completely random. New equipment and/or heroes are not always guaranteed. If a player spends real money, one would expect for her to receive something tangible for it. To unlock a hero, one must get enough hero tokens to add them to their team. For example, let’s say a user wants Black Panther. They would need to get 15 Black Panther tokens to unlock him. On an orb opening, one may receive 5 Black Panther tokens meaning that the user may have to open more than one orb to get the tokens for the hero they want. Hence, more money spent. And therein lies the problem with this game. It taunts the player to gain their favorite heroes and top tier equipment by spending money, and then when one spends money, the system is rigged for them to not receive what they paid for, prompting one to spend more money to try again, and again, and again. Granted the game can be played completely for free. But the orb process has soured me on this one. If you’d love to give this a try, you can find Marvel Strike Force in your Google Play or IOS store. As for me, I will stay away. Ryan Files is an avid video game consumer, reviewer, and critic hailing from the boondocks of Illinois. He has taken his ethnographic cultural studies background and applied them to his love of geekdom. He is a huge Star Wars nerd, Castlevania fanatic, and his power level is definitely over 9000. When he isn’t online writing about how he misses old school beat em’ ups like Final Fight, Streets of Rage, or TMNT IV Turtles in Time, he raises his brood of 3 Metroid children with the most awesome wife a blerd could ask for. You can reach the mumbly one @moblipeg on Twitter.